Sr Marie Michèle (Jeanne Marie Malinge)was born on September 24th 1922, at Saint Pierre-Montlimart, Maine et Loire, France, into a strong Christian family. Her father died in January 1925 when she was not yet three years old. She had only one sister, Marie, with whom she was very close and some cousins who were also close to her. After her studies at Angers, where she received her elementary certificate and a diploma in accounting and stenography, she worked for several years in an office. She entered the postulate on September 10th 1948. Part of her novitiate was made at Estrablin (Isère) and she made profession on March 9th 1951 at Sainte Foy-lès-Lyon. In November she embarked from Marseille for New Caledonia on the Sagitaire. For fifteen years she taught in different parts of the Territory. From 1952 to 1954, she was at Bourail, then at Pouebo; in 1956, she spent a year at the Thio mission and later went for a short time to the Marie Reine school at Thabor. 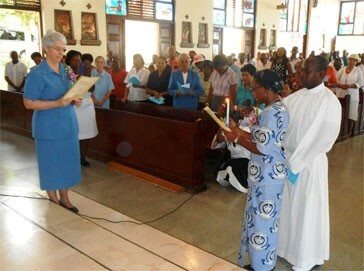 In April 1957 she returned to Thio but in the Sainte Chantal community. In 1961 she went to Saint Louis and within the year was put in charge of the Saint Tarcisius School at Canala. This school that received young boys who showed a desire to become priests will miss her, as she always had a great concern for vocations. In 1966, she returned to France for a holiday and for her second novitiate. She was then put in charge of the Sister students. Although she was very good-natured, she was a little rigid when she had to be in charge, so she found this service very difficult and exhausting. In 1969, she was called to Rome to serve in the secretariat of the General Council. First she went to London for several weeks to study English. She stayed in Rome until the end of 1976. While there she participated in a prayer group at Saint Louis des Français, and went there once a week to welcome pilgrims. In 1976, she returned to France for a holiday and then left again for New Caledonia. 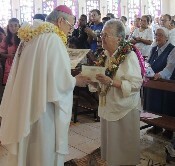 On her return to Noumea, her secretarial gifts were placed at the service of the diocese where she worked at the Center for Religious Education of Noumea. This work was very demanding and difficult because they were redoing all the catechetical manuals. She gave herself to it wholeheartedly, happy to participate in a hidden way in catechetical work. In 1977 she went to New Zealand for several weeks to improve her English. In June 1989 she was once again named to serve at the Secretariat in Rome. 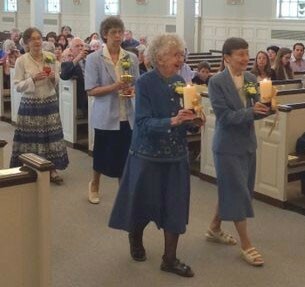 In 1996, she participated in a renewal program for senior sisters held in Rome and then returned to France. 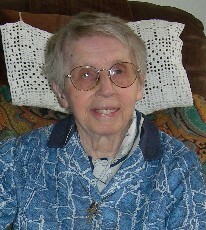 Sr Marie Michèle was a woman of prayer. 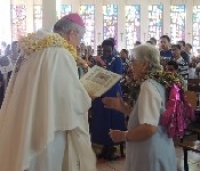 She needed to share her faith and took part in prayer groups in both Rome and in Noumea. She loved to pray for the whole world, she always followed the broadcasts of the Christian Radio Fourvière, which brought her an ecumenical dimension as well as openness to world events. Being very sensitive and delicate by nature, the violence of the world shocked her. 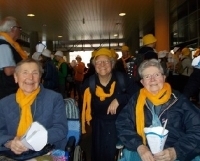 Until the end of her life she was a member of ACAT (Christian Action for the Abolition of Torture). During these last years, her health deteriorated. Her hands gradually became deformed by arthritis and it was difficult for her to no longer be able to use the computer and to be gradually obliged to give up the services that she had rendered to others. She had been very saddened by the death of her sister in August 2008 and, from that time her own health problems began to multiply. She had to be hospitalized several times. She prepared herself to “depart” in her turn and spoke about it. On the evening of April 4th, her condition became grave and she was rushed to the hospital. She died peacefully at 1 :00am on April 9th at the Dugoujon Geriatric Hospital at Caluire et Cuir. 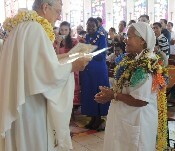 Sr Monika Pagatele was with her. That afternoon she had received the sacrament of the sick. She was conscious, but unable to talk. This morning, Holy Saturday, the 11th of April, her solemn funeral was held. Her cousins from Angers were not able to come but sent flowers. The refrain sung several times: “Those who love have already passed through death, nothing can separate them from the love of the Living God” set the tone for the Easter Vigil, a time full of hope. To begin again a new age » [approximate translation]. We cannot doubt that her death, during the celebration of the paschal mystery, led her to a great welcome into the house of the Father.